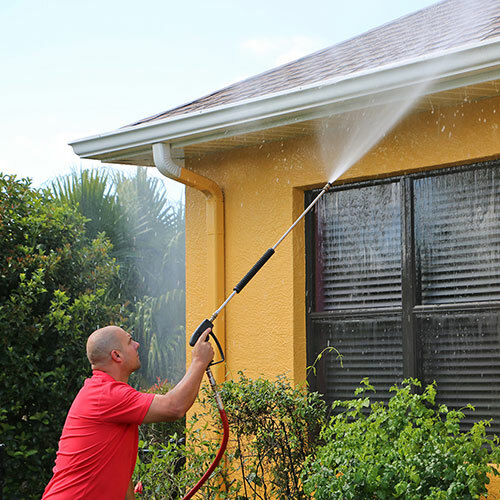 We provide high-quality affordable pressure washing for homeowners in Venice, FL. Red Hot Services will clean the exterior of your home from the roof to your driveways and sidewalks. We even pressure clean pool enclosures without the risk of damaging the delicate screens. And our customized solution is safe for all types of roofs including clay tiles, asphalt shingles, and metal. Your satisfaction is guaranteed with our 3-year warranty. There is no better or safer way to bring back the natural beauty of your home than with our exterior pressure cleaning service. In fact, pressure cleaning can add $10,000-$15,000 to a home’s value, according to the National Association of Realtors (NAR). That’s a big return for a small investment. Our trained technicians thoroughly clean the baked-in dirt and grime from tile roofs, stucco, aluminum siding, and other surfaces without damaging the paint or windows. Our soft washing process even kills and dissolves bacteria and fungus including mold! This will instantly improve your home’s curb appeal. High-pressure cleaning is not safe for roofs which is why Red Hot Services uses soft washing to clean and disinfect the roof, screened pool enclosures and exterior walls, including siding. Our soft washing process uses 200 psi of pressure at 8 gallons of hot water per minute that is mixed with our custom blend of biodegradable cleaning agents to melt away years of accumulated dirt, grime, and mold. This is a safer alternative to other cleaning processes as it limits the amount of walking our technicians need to do on the roof. This avoids damaging soffits, facia, screens, tiles, shingles, and other materials. In fact, high-pressure cleaning can void the warranty of some roofs. We save our high pressure (3500 psi) cleaning for strong surfaces including brick paver and concrete patios, driveways and sidewalks. It removes dirt, grime, algae, mold and oil stains. Our trained technicians prep the surface and power wash it until thoroughly cleaned. For stubborn stains, we may apply more than one coat of our eco-friendly detergent. Our process is safe for use around plants, vegetation, and pets. Red Hot Services pressure cleaning/soft washing is safe and effective for most home exterior surfaces. When your orange clay tiles turn black you know its way past time for your roof to be cleaned. The accumulation of dirt and grime isn’t just unsightly, it can actually harm your roofing materials. The abrasion from wind and rain can cause tiny holes in the tiles that allow the absorption of moisture that can lead to a premature roof replacement. It can also attract pests. Our soft washing process safely cleans and disinfects your entire roof bringing back its glorious luster. And our cleaning agents don’t just wash the grime away, it kills mold, bacteria, and fungus on contact. This helps prevent the reoccurrence of mold. Soft washing is safe for asphalt, clay, metal and other types of roofing materials. We also clean the gutters removing leaves, twigs and other debris to improve drainage. Plus, our technicians are able to completely clean your roof and gutters without having to walk on the entire surface. This limits the possibility of accidental damage to roofing materials. Red Hot Services are provided by professionally trained technicians that work directly for us. We do not outsource workers from other providers. We are fully licensed and insured. All work is backed by our impressive 3-year service guarantee. You will love the clean appearance of your home in Venice, FL. 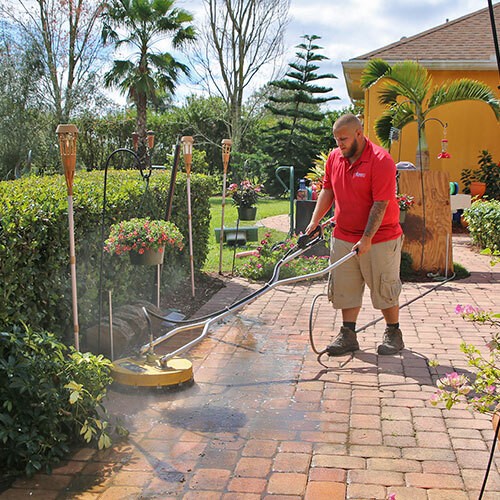 Our pressure cleaning removes stains, dirt, and grime that are covering the beautiful driveway and walkways leading to your home. Years of rust, oil, algae and other stains completely vanish from your brick paver or concrete surfaces without a trace. Your concrete surfaces will be shining bright white again and your brick pavers will have a sheen you haven’t seen in years. Our custom eco-friendly detergent formula will not damage the walkway or driveway surface and it is pet, plant, and vegetation-safe. Your steel and aluminum screen enclosures can take a beating from Mother Nature while collecting an assortment of dirt, mold, algae and other unwanted particles. And with every rain, filth and muck are forced into your pool which could require additional maintenance to return to safe pH levels. Our soft washing safely cleans screened-in pool enclosures removing the build-up without damaging the screens or weakening the metal structure. Plus, our biodegradable cleaning agents kill and dissolves mold and bacteria from the enclosure. This cost-effective service will help keep your pool cleaner longer. Once the screened enclosure has been pressure cleaned, our technicians will pressure-wash the patio to disinfect and clean the surface removing those tough, unsightly stains. We clean just about any exterior surface including brick pavers, travertine, concrete and more. 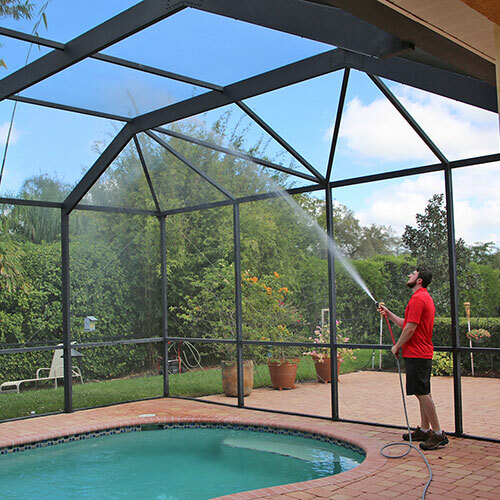 Enjoy a clean screened pool enclosure and patio in Venice, FL. Call to schedule a free on-site estimate today!